He’s a CPS Energy worker whose second job requires thick skin. It’s a part-time job where customers call you vulgar, obscene names, bystanders throw objects at you, and after you clock out a security guard has to walk you to your car. That’s the life of a high school football referee. And, Abraham Gallegos knows it all too well. “Officiating, like any sport, is demanding. It is always a no-win situation. Fifty percent of the fans are going to love you, while the other 50… well, let’s just say not so much,” he says. Gallegos, an environmental coordinator, initially took to the gridiron job as a way to earn some extra cash. But after 34 years, he realizes the gig has given him a unique perspective about sports, people and joint pain. 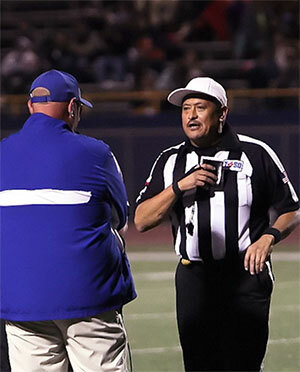 Abraham Gallegos has 34 years as a high school football official — the last nine as a head referee. These days he works as the “white hat” – the game’s referee. It has extended his career because it requires less running. The state playoffs are winding to a close. While Gallegos won’t officiate in any of this year’s playoff games, he says he’s had his share of blown calls during the heat of the action. That takes us back to the notion that it’s a job that requires thick skin. “One minute they love you, the next they hate you,” says Gallegos. “The players, coaches and fans are very passionate about their team’s success. It is always us five officials against everyone else. “There were even a few times I told myself, ‘What the hell am I doing out here?’ But then, there’s always a feeling of accomplishment when you walk, or run after the crowd has turned on you, off the field. That’s awesome Abe, having you as a friend I did not know this about you. Good job. I’ve known Abe for 10 years because I officiate with him in the San Antonio chapter ofor the Texas Association of Sportsecurity Officials (TASO). He is well-respected by the coaches and his fellow officials because he always works a solid ball game and is a professional while doing it. He represents our chapter very well both on and off the field. I’m proud to call him a friend! Thank you for featuring him in your online newsletter.